Hundreds of eager kids will gather in Bryant Park on Thursday for an open mic event to celebrate poetry on the tenth annual Poem in Your Pocket Day. Could you do it? Stand on a stage in front of not only your peers and teachers, but also the general public of New York City and share your own creative writing? Each year proves to be a truly amazing display of young creativity and bravado. 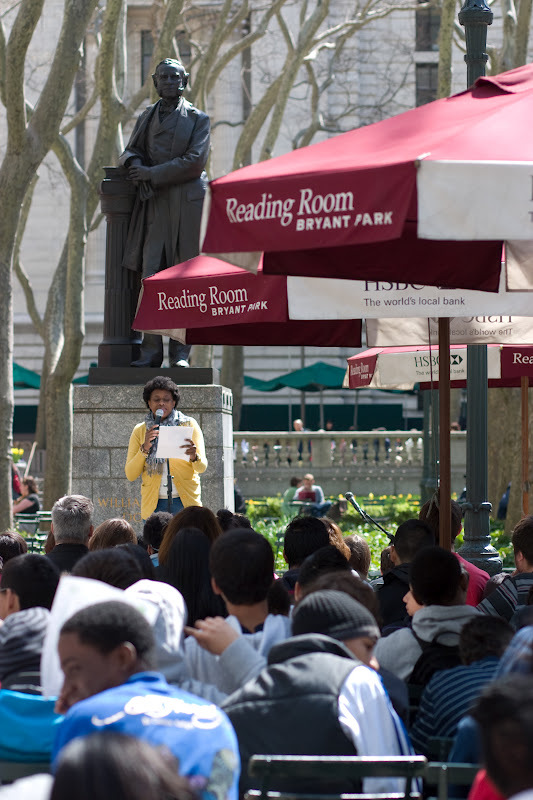 In addition to student-poets, the Bryant Park Reading Room sponsored by HSBC will also host a slew of special guests on Thursday including NYC Youth Poet Laureate Ishmael Islam, and published guest poet Mahogany Browne. Music will be provided by Aurora Barnes and DJ Flip Bundles. Attendees will also receive a free book of poetry, while supplies last. So get those poems ready... Thursday is all about sharing your favorite poetry. Want to join in the fun virtually? Why not share a stanza with us on Twitter. Tweet us @BryantParkNYC #PIYP. Hi there. I know we missed it this year, but for next year, how do I sign my students up to read their poetry? Hi Zara, thanks for asking! Please email Nancy in our office at nng (at) urbanmgt (dot) com, with your school name and she'll add you to the invitation list.